Basement walls and design differ from other structural walls because in the basement inside of wall have living space and earth filling on the outside of wall i.e. why these are structurally designed as retaining walls to overcome the lateral pressure of outside filling of soil/earth. RCC wall abating the brick wall. The basement walls are either load bearing to bear the load of super structure or as non load bearing walls. In case of non load bearing walls, the load of the super structure is bear by the beams which are resting on the columns. The concrete is good in compression but weak in tension due to this fact when super structure load comes on wall than the wall become out of plumb and hence cause wall failure. Similar is the case in the long and high or tall wall. 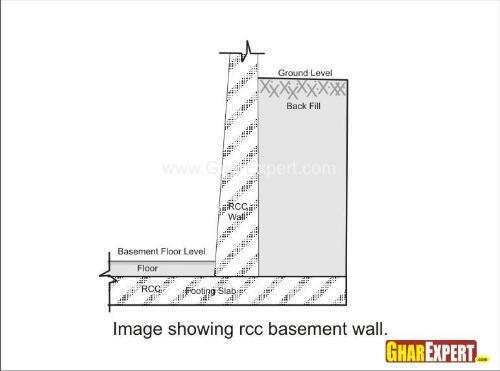 So avoid this situation cement concrete wall is strengthening with the MS steel bars and thus it is known as RCC wall. As stated above that the basement outer walls are act as retaining wall and it is some time called as cantilever retaining wall because it is free standing structure without lateral supports at top. The lateral pressure at the top of basement wall is minimum and increased with the depth and maximum at the bottom. The forces created by the earth may push the basement wall forward or over turn when it is not designed well/ properly. While designing the basement wall, all the forces should be taken in to consideration such as earth pressure, rain water effect and vibratory pressure due to side traffic. The width of foundation is increase from top level of earth up to the bottom of the foundation and the width should be maximum at bottom. In general terms the basement wall should be safe against excessive foundation pressure, sliding and over turning. Before designing the foundation of basement wall one should collect the design data required for designing the foundation of wall such as super structure load and characteristics of the ground. This will help to obtain economy in construction work and safety of structure. At the time of designing the basement foundation wall care should be taken to calculate the all the load which are to be bear by the foundation. The load bear by the foundation are the combined dead load, imposed load and wind load and these load are transmit by the foundation to the ground. The safe bearing capacity of the soil should be sufficient to bear the net loading intensity pressure coming on the soil or in other words the safe bearing capacity of soil should be more to the net loading intensity of pressure coming on it. The design of foundation should be done keeping in view minimizing the settlement on the base of foundation and it should be uniform under the whole of the building to keep away from any damage to the building /structure. During designing process safe bearing capacity of soil should be well studied and care should be taken that design the building accordingly as submerged soil and clay have less bearing capacity where as dry coarse and well graded dense sand have maximum bearing capacity and shear resistance which will give very economical and safe design for structure. In designing process the ratio of base coat i.e. foundation concrete should be 1:4:8 and brick masonry cement mortar should be 1:4 to 1:6 as loading condition. Where RCC structure is to be constructed than the ratio of concrete used as 1:2:4 or 1:1.5:3. During the excavation of foundation care should be taken that depth and width of foundation should match the structural design. If there is no any design of foundation then keep the depth of the foundation at least one meter from the bottom of basement. Mark the center line and fix the level on the BURJIS and check the length, width and depth of excavation accordingly as stated in layout of building. 2. Care should be taken that no any excavated material/ earth should be dumped at a distance of 1 meter from the edges of the excavated wall on either side. 3. The construction work i.e. laying foundation concrete should be done on dry soil. 4. For emergency i.e. in case of rain water, there should be arrangement of water pump for pumping out rain water. 5. After excavation, it should be ensure that the bottom layer of the foundation should be compacted. 6. Check the bottom layer and ensure that there should be no soft places in foundation and free from roots of tree. 7. If found any soft/ defective spots or roots of tree, it should be dug out and the pit must be filled with concrete/ hard material. During rainy season excavation for ‘Basement’ wall should not be taken. At the time of construction of basement it should be ensured that there is no any damage to the adjoining structure. During the construction of basement, one should have arrangement of water pump, for pumping out of water either from rain or any leakage or breakage in pipe line. The depth of foundation should be at least 5 feet below the floor level of the basement. The walls of basement should be damp proof to prevent any seepage/dampness.